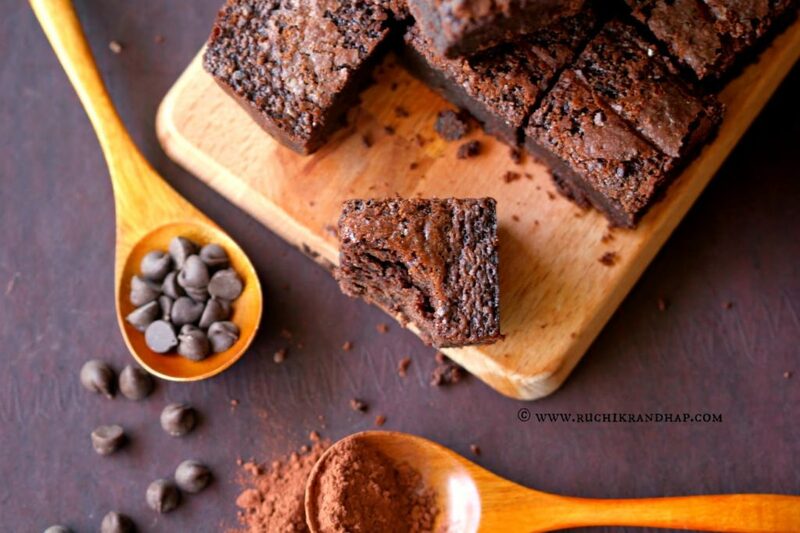 Divine Chocolate Brownies and Celebrating 6 years of Blogging! Ruchik Randhap completed 6 years of active blogging yesterday! Yay! This journey has been a special one for me as with each passing day I get better at a skill I thought I never possessed. From someone who couldn’t as much make something as basic as rice, I think I’ve come a long way. I am thankful and grateful to God and everyone who has contributed in some way or the other to my life. Honestly, blogging has become a lifeline for me, my passion and in a strangely wonderful way, my occupation. The whole package of cooking, clicking and blogging has become such huge learning experience for me that most often than not, I eat, sleep and dream food. I had read somewhere that food bloggers are perhaps the most hardworking of the lot as they handle a whole gamut of things from shopping for ingredients, prepping, cooking, plating, styling, presenting, clicking, editing and writing a recipe. Couldn’t agree more. Blogging has just made me a better multi tasker than ever before and it humbles me everytime I stumble upon a new food blog that has been so passionately put together. Just like most passionate food bloggers I know, flipping through cookbooks and browsing the net for recipes is one of my most favourite pass times. Sometimes it becomes such an obsession that you can even find me taking pictures of recipes in magazines at the salon or the doctor’s clinic. At times like these I snap myself out of my trance and pull myself away to focus on the more important things of my life. This should explain why you find me gone for a few days at a stretch sometimes. I always like to return with a fresh mind and with new stories to tell. Thank you for being part of this journey. It is because of my readers that I am able to continue with this task of bringing you recipes of some tried and tested Mangalorean favourites along with some popular, contemporary ones! Ok! That’s the end of the speech! I don’t intend boring you year after year. Coming to today’s recipe, well, what do I say? It is perhaps one of my most favourite recipes of all time! I’ve made it thrice already and will be making it again soon for a party. Despite the fact that it has so much chocolate in it it doesn’t overwhelm you in anyway. I found this recipe in the Friday magazine and wanted to try it out immediately. I substituted the dark chocolate with plain cooking chocolate and added half a tablespoon of extra unsweetened cocoa to bring in a depth of flavour that would have been contributed by the dark chocolate had I used it. Everyone who ate it enjoyed every morsel with an ‘mmmmmm! !’ escaping their lips as they quietly munched on it. Every single person had an expression of ‘Oh my God, this tastes soooooo good! !’ on their faces – pretty much my reaction when I first took a bite. 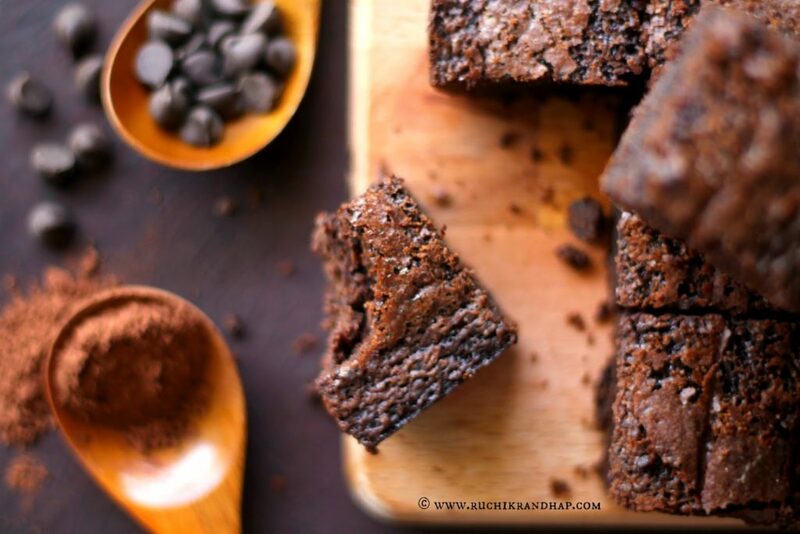 The recipe was originally called as the ‘devilish chocolate brownies’ but I decided to rechristen them as the ‘divine chocolate brownies’ as they are so delicious that they transport you directly to chocolate heaven, bite after bite! Why give credit to the devil for what I believe is solely divine intervention? 😉 O.k! I better stop my preaching here! I do think they are utterly and wildly wicked in a good sort of way cuz if you indulge in one too many, they will definitely do bad things to your waistline!! However, make them and eat them you must because, enjoy them you will! But don’t be selfish, make a double batch and share them with your loved ones for any occasion (or none at all). Good things don’t need a celebration, but if you must, make them and serve them hot, along with some vanilla ice cream on the side – your guests won’t be able to forget the great dessert you served them for a long long time! 1. Preheat oven to 180 degrees C. Grease and line an 18cm square tin with parchment paper – try overlapping the paper over the sides of the pan so that it becomes easy to pull out the entire brownie once it is baked. 2. Sift together the flour, cocoa & salt and keep aside. 3. Melt the chopped chocolate, butter and vanilla extract together in a heatproof bowl set over a pan of barely simmering water. Make sure that the water does not touch the base of the bowl. Stir until the chocolate is melted and there are no lumps. 4. Remove the bowl from the heat, stir in the sugar until melted and keep aside to cool for a bit. 5. Now add the lightly beaten eggs, add the flour, cocoa and salt mixture and fold in until the mixture is smooth and glossy. Stir in the chocolate chips till they are evenly mixed. 6. Pour the mixture into the prepared pan and level the surface. Bake in the preheated oven for 23-25 minutes or till the top starts to crack. The centre will remain gooey/fudgy. 7. Turn off the oven and leave the brownies to bake for a further 5 minutes. Then remove the tin and leave it on a wire rack to cool completely. 8. Lift the overlapping parchment flaps and place the brownie on a board and cut into 9 or 16 pieces as desired. 9. Serve them hot (microwaved for 15 seconds) with some vanilla icecream or plain – hot or at room temperature! Do not attempt removing the brownie out of the tin when it is still hot. Unlike cakes, brownies are a lot more fudgy with a gooey/cakey centre – you may damage the shape and break it if you forcibly try to remove it out. Wait till it has cooled considerably before removing the baking paper/parchment too. Happy Birthday to your blog and wishes for many more to come..those brownies look surely very divine!.. @ Srivalli: Thanks so much!!! conrats on yet another year! it is always a pleasure to bring your dishes to the table with homestyle cooking and authentic taste….keep it up! one request (ha ha)- slow down please-cos sometimes it is difficult to keep up!!!! can you give a substitute for choc chips? not at all. 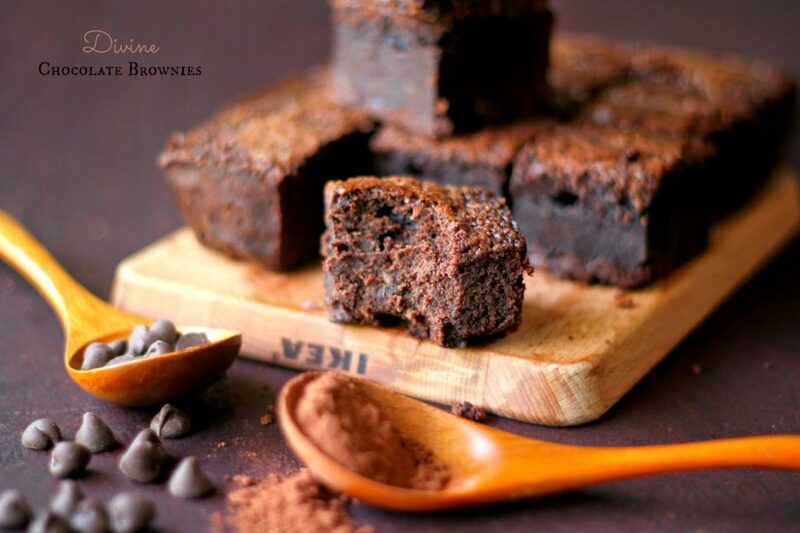 the brownies are a tad too rich thou……..but then, who is complaiing!! thnks and good day. @Shireen :Congrats for completing 6 years !.. can you tell me the substitute of egg? 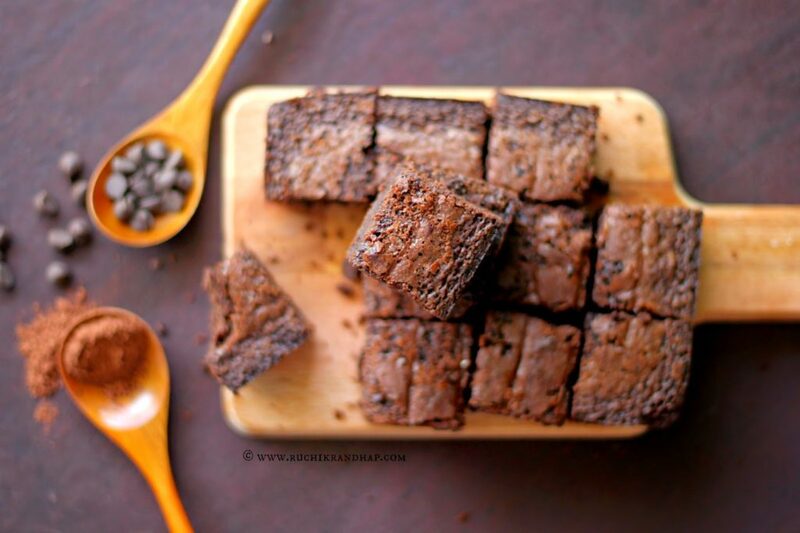 @ Smitha: So happy to know that you enjoyed these brownies 🙂 Thanks for your feedback!